The Kunsthistorisches Museum (KHM) in Vienna appeared as part of the extraordinary burst of construction activity that accompanied the development of the city’s Ringstrassen (Ring boulevard) in the latter part of the nineteenth century. The museum building took 20 years to complete, officially opening in 1891. Its main purpose was to house the art collected by various imperial personalities over the centuries. Given the interests, wealth, and influence of the Habsburg dynasty, that was an awful lot of paintings, sculptures and the like. Art of such high calibre deserved a building to match. Unfortunately, the suggestions originally proposed by various architects met with little enthusiasm. In the end, the museum’s design became dictated within a wider project drawn up with Emperor Franz Joseph’s approval by Gottfried Semper and Karl Freiherr von Hasenauer. The same pair also designed the Burgtheater, another standout building bordering the Ringstrassen. The wider project was the Kaiserforum or Imperial Forum, intended as an impressive complex of buildings and arches spanning the Ring, with the art and natural history museums forming the southern part. The two museums were designed as mirror images of one another, separated by a landscaped square. Both museums went up according to plan, but the forum itself was never completed. Money was one issue, as was growing disinterest from the Emperor, and any chance of finishing the whole thing effectively ended with World War I. The outside of the museum features a series of statutes built as the personification of the arts and art history, together with representations of real people – famous artists and their sponsors. The statues appear chronologically, beginning with the ancients at the back of the building and moving forward in time clockwise. 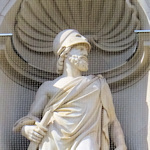 So, for example, at the rear of the building you’ll find the Athenian statesman, Pericles, or Alexander the Great. At the front, great centers of Renaissance culture like Venice and statues of artists like Titian, Michelangelo and Raphael. The side facing the Ring boasts representations of those modern cities already possessed of great art museums back then, like London, Paris, Madrid, and Milan. Needless, to say the interior of the museum also reflects the splendour of its art collection and imperial sponsor.